In my neighbourhood there’s a heritage program called True Colours wherein you can receive a pat on the back from heritage types and sometimes free paint if you agree to paint your house in the original house colours circa 1901. Unfortunately, most True Colours are the official colours of depression: muddy hunter green, dark drab maroon, watery urine-sample yellow, sickly ivory. Before the creep of drabness extends any further, I’m planting my flag for Untrue Colours and championing these exuberant and adventurous feats of house and door painting. If we can’t have innovations this exciting here, maybe we could at least have more true colour. One old heritage neighbourhood in Vancouver is already heading in a more cheerful, anti-rainy-day-blues direction. If you’ve been to Vancouver in February, you’ll know how crucially important some form of cheerful intervention is. Beautiful photo of house in Indiana, above, by i am krisan on Flickr. 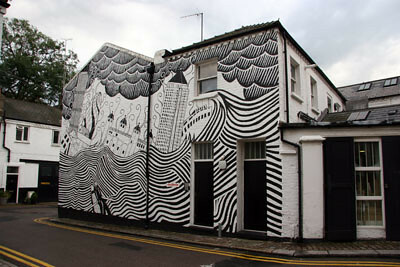 London house decorated by the painter Stanley Donwood, photo by artofthestate. 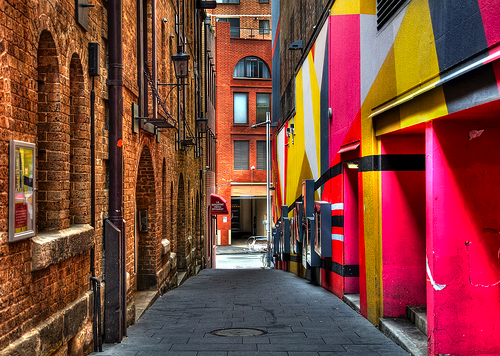 Painted facade in Sydney, Australia, by loveroni. 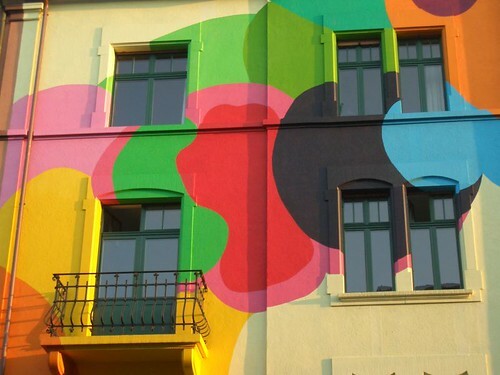 Painted house in Basel, by m.a.r.c. Psychedelic house in Leiden by Karl O’Brien. 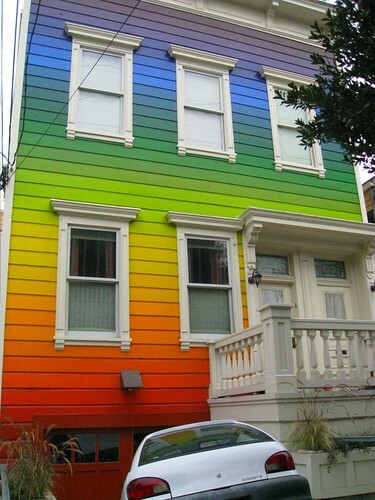 Rainbow house on Clipper Street, San Francisco, by jordanpattern. 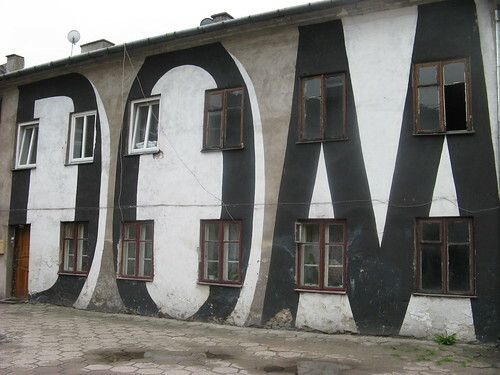 Old mural on a housing building by the Polish art group TWOŻYWO, which turns 20 this year. “Dom” means house or home. By zorro za trzepakiem on Flickr and see also misiekgreen. 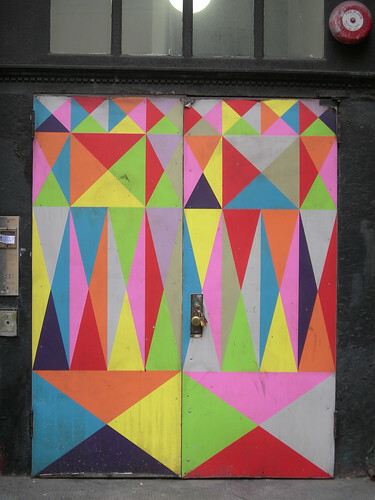 Doors in Soho, NYC, taken last week. Final note: I’m not against heritage preservation; on the contrary. But I’m against slavish, unimaginative heritage preservation. Sarah adds that around 1900 “houses were originally painted those ugly dark colours because the air was so choked with coal pollution it was the only way to hide the dirt and grime. Why continue with an idea based on something that is no longer relevant?” I would also like to add the salient fact that many of the European settlers here were Scots Presbyterian, and since that’s my own heritage I know of what I speak concerning its dour aesthetics. To read about San Francisco’s painted houses, see an interesting entry on Wikipedia. 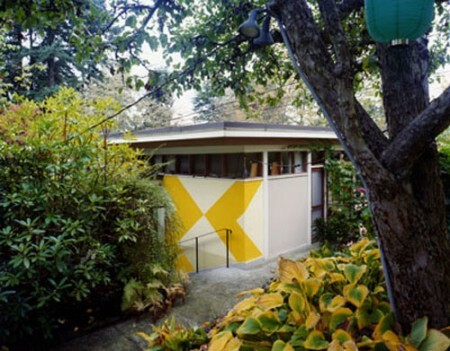 This entry was posted on Wednesday, June 10th, 2009 at 1:12 am	and is filed under architecture, art, British Columbia, Canadian design, craft, design, graphics and signage, humour, landscaping, Vancouver. You can follow any responses to this entry through the RSS 2.0 feed. You can leave a response, or trackback from your own site. That’s one thing I love about London, it’s full of oddly colored houses! Makes one happy, and that’s something we all need more of! each of these houses makes me smile! breaks you out of the day to day reality, and makes you realize how important art is to a community.